This Spring, CLBB leadership met with center scientists and board members to discuss the center’s achievements over the past year, ranging from our public panels on Memory and Empathy to our OpEd’s in the Huffington Post and Washington Post. Joshua Buckholtz, Assistant Professor in the Harvard Department of Psychology, and CLBB faculty member, spoke to the group about a relatively narrow set of questions in the field of “neurolaw”: those that the justice system actually wants answered, and those that neuroscience might have the tools to answer (either now or in the future). Dr. Buckholtz also discussed an exciting new CLBB-sponsored initiative to study the effects of brain stimulation to curb impulsive tendencies. CLBB co-directors Judith Edersheim and Bruce Price, along with Director of Scientific Programs, Justin Baker, provided the Year In Review and outlined CLBB’s mission, research strategy and core program areas. 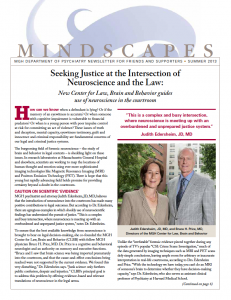 The Center for Law, Brain and Behavior is featured on the front page of this summer’s Mindscapes, a newsletter published by the Massachusetts General Hospital Department of Psychiatry. CLBB’s principal goal, the article reports, “is to address this problem by offering evidence-based and relevant translations of neuroscience in the legal arena.” This means first determining, through close contact with the legal community, what is relevant, and then responsibly translating scientific findings with those stakeholders in mind. Read the full article in MINDSCAPES. Young people in the United States are entering the youth justice system in shocking numbers, and many seem to come out worse than when they went in. The staggering costs and recidivism — more than half of incarcerated kids are likely to recommit crimes after being released — have led people to wonder if there is a better way to deal with youth offenders and whether exposure to the system itself could in fact be perpetuating a life of crime. While only about 25 percent of juvenile cases involve violent acts, the system is also sweeping up kids who have committed minor infractions. From cops to judges to families, many are urgently seeking alternatives to the juvenile justice system. On the far other side of the world, modern New Zealand youth court has incorporated restorative principles of justice adapted from the roots of its indigenous Maori culture, bringing victims and offenders together amongst the community to resolve disputes. Focusing on rehabilitation more than punishment, New Zealand has seen great success and set a precedent for youth justice around the globe. In Maori villages of the past, a crime would put the community out of balance. Traditional Maori justice turns on the idea of restoring that balance. Fixing Juvie Justice crosses the globe to a culturally sacred marae (meeting ground) where Judge Heemi Taumanu has established an alternative youth court that draws on these principles. Now a group of innovators in Baltimore turns to the wisdom of the Maori for a possible solution. Using theories behind basic human emotions, Dr. Lauren Abramson adapts the Maori model and starts an organization that facilitates community conferences as a youth justice alternative, to give hope to those disgruntled with a broken system in Baltimore. Abramson’s quest is to challenge the current system and create change from the ground up by giving kids an opportunity to resolve conflicts through these community conferences rather than going to court. Viewers see how people come together to resolve conflict in their own communities and all of the drama that unfolds when everyone is given a chance and encouraged to let emotions out. Can a community-based approach to justice derived from a structure conceived centuries ago in New Zealand give hope to the mean streets of the United States? Fixing Juvie Justice has some answers. Watch the 60 minute program on PBS here. The European Association for Neuroscience and Law (EANL) will hold its first annual meeting in Bonn, Germany, next month, on September 9 and 10. Officially established after in Milan after two years of preliminary work, the association comprises jurists, neuroscientists, philosophers, neuroethicists and media representatives hailing from leading European and U.S. universities and organizations. Their aim, according to judge Amedeo Santosuosso, director of ECTL (European Center for Law Science and new Technologies ) at the University of Pavia (Italy) and President of the EANL steering committee, is to “explore from a theoretical point of view all the critical aspects of the interaction between the outcomes of brain research, the new technologies and the courts.” The EANL is also working to collect and analyze available law cases in Europe and U.S.A., as well as their outcomes.